The second in a series of articles on period patinas focuses on replicating an early 1900s frame originally created for Taos school of art founder E. Irving Couse. The legend of the founding of New Mexico’s premier art colony has developed over the decades on the basis of sketchy details. Bound from Denver for Mexico on an extended painting and camping expedition in the summer of 1898, Ernest Blumenschein and Bert Phillips suffered a broken carriage wheel in the rugged mountain country of northern New Mexico. Recalling tales of Taos told in Paris by their friend Joseph Sharp, the painters determined to seek a blacksmith’s help in that small village, twenty-plus miles away. Thus it was that on the fourth day of September, Blumenschein, wheel to the shoulder, found himself silent upon a peak in Taos, gazing with Columbian awe at a new world that far surpassed the “dim picture…made in imagination from Sharp’s slight description. The morning was sparkling and stimulating,” he recalled. 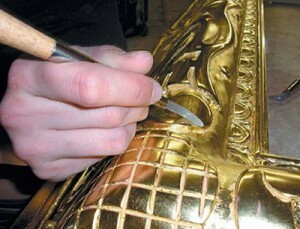 After carving the moulding to resemble the original Couse frame, the first step was applying 22k gold leaf. The highlights of the frame were then burnished, corresponding to the red clay bole applied beneath the gilding onto the higher areas and the detail work on the frame. Artists. They painted what they found around them, local Indians and pueblos, fabulous never-ending landscapes, and vistas of northern New Mexico. A light rub with very fine steel wool exposed some of the clay and added a look that resembled the effect that cleaning over time creates. eventually one local frame shop that could carve (perhaps “adze” is more accurate) and metal leaf mouldings of their own simple designs. This was the Woosley Brothers Frame Shop. One of the best-known artists of this group was Irving Couse. He was so influenced by the local Indians and their culture that he used much of their iconology in his artwork as well as in his original frame designs. His carving, however, was not up to his design excellence, so he sent his designs off to a wonderful carver and gilder in New York City by the name of Henry Schultheis. Schultheis would interpret the designs of birds, arrows, and acorns onto one of two mouldings he had run specifically for Couse. One was a cove profile, and the other was a reverse. One of our specialties at Goldleaf Framemakers is replicating those particular styles of Taos School frames. 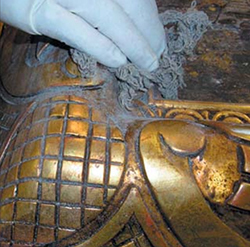 The patina is only found on these strange carves. 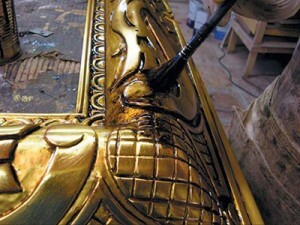 Most were produced in metal leaf or bronze paint, also called Roman gilding. But the ones gilded in 22k or 18k are the greatest. The discovery of this school changed my entire out-look on framemaking as a whole. I had always looked at classical carving and framemaking with a European eye as was taught to me in Manhattan. This is the approach covered with Modigliani frame in “The Perfect Patina” in the August issue of PFM. I learned later of the provincial type of carve and patina on the Taos frames. These artisans worked alone and were not of a production state of mind. This provincial attitude was replicated by some large companies of that era, but they were never able to get the uniqueness of a Schultheis frame made for Couse. I have been very lucky to be asked to reproduce those period frames for my clients. 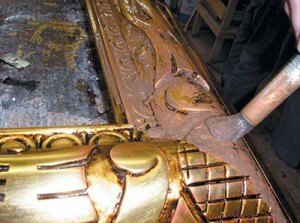 Applying asphaltum gives the replicated frame a look like it had been hanging in a room with a fireplace for 75 years. The story of this great Couse frame began one sunny July morning here in Santa Fe. Ginny Couse, grand-daughter of Irving Couse, came into my shop and literally dragged me to one of our local galleries. On the way, she explained that not only was she in possession of “The Eagles” 1913, but the original frame was also still on it. Seeing one or the other is not that uncommon, but seeing them together in their original state could be very educational. Cleaning back the asphaltum with mineral spirits leaves it just in the recessed areas, just as it would had the frame been given an occasional surface cleaning over the years. As a result, I had a chance to study the carving techniques and how they related to the art. I also studied the subtlety of the surface in between the carves and the actual depth of the carves. To say the least, I have seen many original frames but rarely are they in such pristine condition. I proceeded to measure it and took photos of it from all sides. Back at the shop, I ran a new moulding for it. A Spanish wash was applied that consisted of raw umber, burnt umber, and a touch of white casein paint. Most of this wash was removed with a cloth. As I stated in my last article, patina starts at the wood and moves forward through all the steps in making a picture frame. 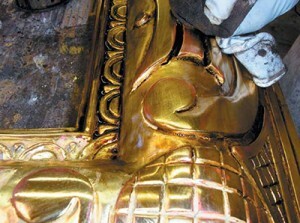 If you start wrong, there is no way the patina on the finished frame will be completely believable. Remember: “Is it real or is it a replication?” After we proceeded to replicate the carve and the adzed surfaces between the different elements, next came the gesso clay and the gilding and burnishing. To do this finish right, I used the basic yellow clay base and added red clay highlights—but only on the very tops of the carved area. After burnishing, just those tips were rubbed very lightly. This is one “busy” frame, so to rub it too much would make the carves jump all over the surface. There was no rub on the original frame by Schultheis; it just appeared on the original naturally over time. He did, however, seal the frame with shellac and tone it with some sort of oil base paint. It looked like Japan paint. 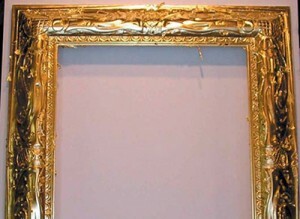 This frame also lived in a cold climate, because there was creosote in the nooks and crannies of the carves that came from the smoke of a fireplace or possibly a wood-burning stove. 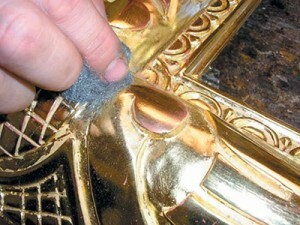 The last part of patina is applying dust just as it would have accumulated over time. To get the look of the original shellac, we mixed amber and clear shellac and misted it unevenly all over the surface, making the surface warmer and/or cooler in different areas. Then asphaltum was added. I like to use that on my Spanish frames to get that old creosote look. You have to be careful with it, though. Too much can make a frame look greasy. It must be put on and taken off. Leave just enough on so that it looks like it was living in a room with a fireplace for over 75 years. Next comes the wash. A kind of a mix of Italian and Spanish wash was used—raw umber, burnt umber, and a touch of white casein paint. Again, it should be put on and taken off. The one common thing omitted from this patina was distressing. The original was pristine, and so is the replica! Next came waxing and dusting. I used a green wax—a mixture of raw umber, artist’s pigment, and paste wax. The dust is, well, cigarette ash. Remember, go easy on the dust. You don’t want the frame to look like you put the dust on it; you want it to look like it accumulated over time. My time is up and I must admit, I’m a little dusty too.